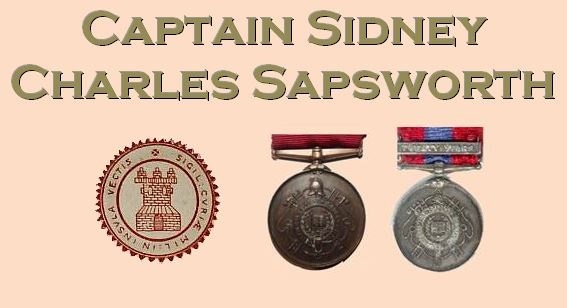 Captain Sidney Charles Sapsworth of Ryde Fire Brigade passed away on 30 November 1926 aged 66. Sidney was born in Edgware Road, Paddington, London in 1861. His parents were Henry, a boat builder, and Mary Ann. The 1871 Census when Sidney was nine, shows that the family were living at 8 New Road, Richmond upon Thames. He was the middle of three brothers. The electoral role for 1881 listed him residing at Coniston Villa, Heathfield South, Twickenham. Ten years later he is back in New Road, Richmond, residing with his wife Henrietta and two year old daughter Lillian at No. 16, next door to his parents who were then at No. 15. By this stage his father had diversified into the world of bookmaking along with Sidney's elder brother Henry senior, whilst Sidney himself was trading as a fruiterer and florist. By this stage he had been a member of the Richmond Volunteer Fire Brigade for two years. A report in the Surrey Comet of September 1887 suggests Sidney was a fit and active member of the brigade as he gathered a pair of medals when competing in various events attended by several fire brigades of the region at the Old Deer Park. The report also details his elder brother Henry as competing, suggesting that brigade service was a family concern. Soon after this he was appointed superintendent in charge of the brigade and during his tenure he was officer in charge at some substantial fires including those at the Star and Garter Hotel, Hampton Court Palace and Watney's Brewery. He also led his brigade on a torrid 50 mile horse-drawn response when the barracks in Winchester suffered a severe fire in 1894 and they were among several that attended to assist the local brigade. In the same year he announced his resignation from the Richmond brigade on account of his plan to move with his family to the Isle of Wight from their home at 15 Kew Road, Richmond. 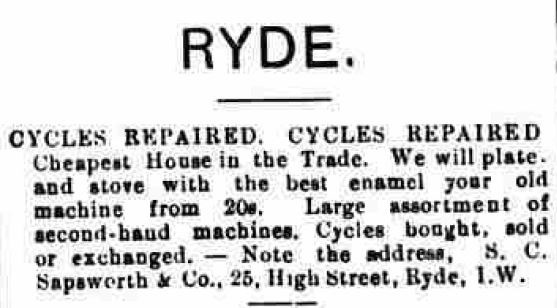 Sidney and family moved to Ryde and set up both home and business at the same address, as detailed in the advertisement of the period (below) which appeared in the Isle of Wight County Press. It wasn't long before Sidney saw a gap in an evolving market and expanded his business portfolio to include motorised vehicles. In 1897 Ryde's brigade Captain H.V. Carter announced his resignation from the post he'd fulfilled for only a few years. The town's Fire Brigade Committee invited applications for the role and were overwhelmed to receive Sidney's and discover that he had previously been the superintendent of the esteemed Richmond brigade (which at the time he left possessed two steam fire-engines). He was immediately appointed and afforded £6 worth of new uniform and at his insistence £30 worth of canvas hose, a hand-pump, two life-lines, four brass nozzles of differing size and a new tarpaulin for the fire-escape were ordered and added to the brigade's equipment list. However one thing he couldn't alter was the fire station, at the rear of the Town Hall in Market Street, which had been outgrown by the brigade's development such that the escape ladder had to be kept outside under the tarpaulin in the narrow passage between the Town Hall and the neighbouring church. Just five weeks after being appointed Captain Sapsworth led his new brigade behind the beat of the Volunteer Band at the town's annual Horse and Carriage Show. 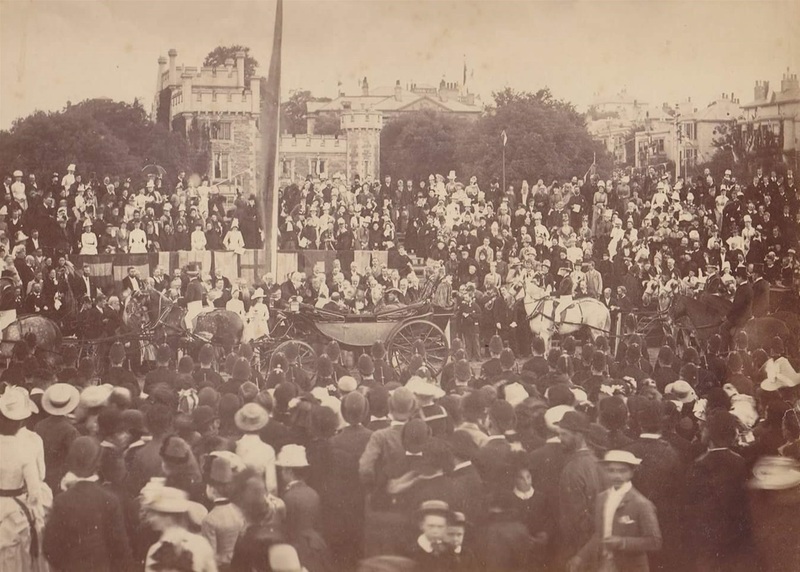 Less than a month after that he was again in charge of officiating his firemen for ceremonial purposes with the planned visit of Queen Victoria as an element of her Diamond Jubilee tour of the country. On Sapsworth's instructions two ladders were pitched to create a 'V' at the road leading to the Victoria Pier from which the men strung evergreens and flags. As Her Majesty's carriage approached to pass along the Esplanade, Captain Sapsworth and his men mounted the precariously positioned ladder and stood to the attention on its rounds ('rounds' - fire service word for 'rungs'). Queen Victoria passing the Ryde Castle, 29 July 1897. In 1898 Captain Sapsworth was responsible for getting electric fire alarms installed in each of the firemen's homes. He put this to the test on 18 April. The Captain depressed a button at the Town Hall and awaited his men's arrival. The correspondent of the IW Observer who observed the events wrote; it was quite a stirring sight to see the firemen running from all parts of the town simultaneously to the Town Hall. Once Sapsworth had the men in attendance he instructed them to immediately deploy into drills. 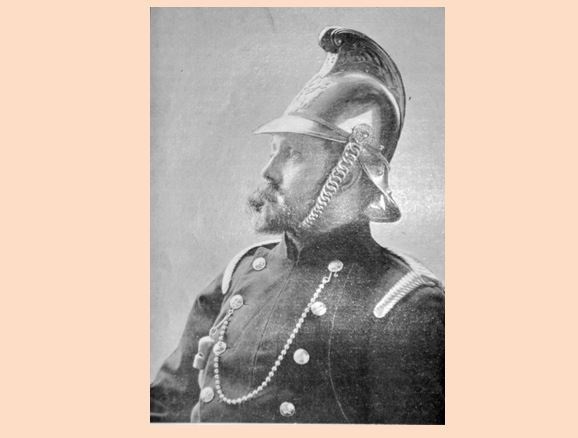 In 1901 The Fireman magazine ran an article dedicated to the life and service of Captain Sapsworth which featured the photograph at the top of this web page. At the time he expressed to the correspondent that his desire was to ensure Ryde acquired a steam fire engine as soon as possible. However in-fighting in the Council chamber over which type of steam engine to procure caused a rift that ended with the initiative being tossed out and the matter didn't re-emerge for many years. Over the course of his first six years at Ryde, Captain Sapsworth was reported favourably engaging his brigade in a series of fires in the town which culminated in the 1904 conflagration of immense proportions at Appley Towers. Given the comparative scale of some of the fires he'd dealt with in Richmond, this was well within his power but on this occasion without the advantage of steam fire engines. Thinking fast he immediately despatched callers to make pleas of assistance to Sandown, Shanklin and Newport; all of whom appeased the need. 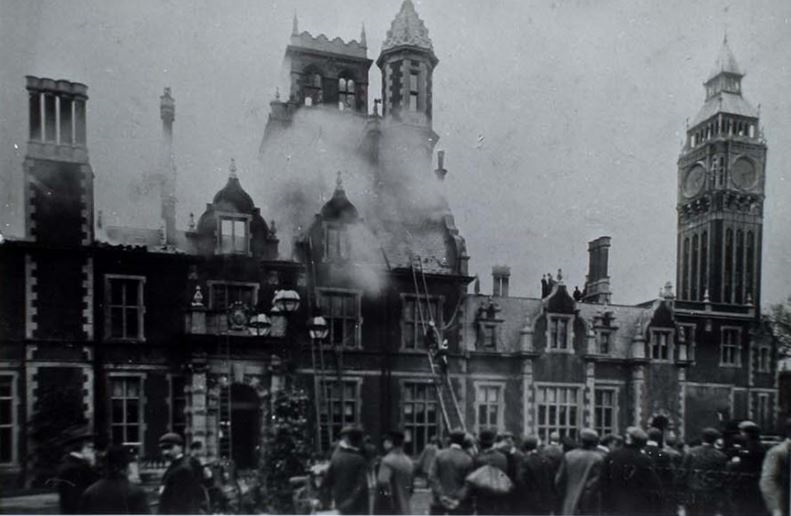 22 March 1904, the Appley Towers fire. Captain Sapsworth's concern for his men and their families was often remarked upon. It was never more evident than the case of the unexpected and premature death of Fireman W. Whittington. Sapsworth used his influence with the Council and local business to ensure that Whittington's widow and children were financially provided for and afforded a secure home. 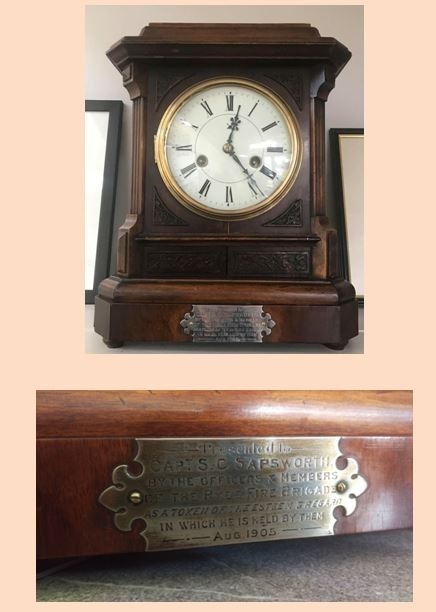 Evidently the firemen thought as much of the Captain too and in 1905 they presented him with a clock bearing an inscription (below). The existence of the clock was unknown to current members of Ryde Fire Station until the Isle of Wight Fire and Rescue Service headquarters received a communication in early 2018. The call came from a Bob and Beth Kandra of the United States. They had found, admired and purchased the clock from a thrift shop in their home town of Fairview, North Carolina. On getting it home they read the plaque and decided to research Ryde Fire Brigade. When they discovered that the town still had its own fire station they insisted the clock was returned. Such was their generosity and philanthropy not only did they not want reimbursement for its purchase, they even paid for it to be conveyed across the Atlantic. Ryde Fire Station has since had the clock fully restored both mechanically and aesthetically and it now chimes every thirty minutes in the station mess room. In autumn of 1904 Captain Sapsworth, who had already achieved several significant improvements to the capability and welfare of his firemen's lot, achieved what at one stage seemed the impossible and the brigade moved from the Town Hall to the town's first purpose built fire station in Brunswick Street (now Station Street). 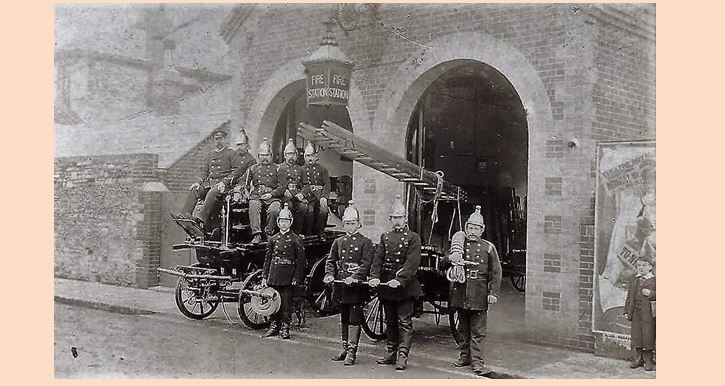 Captain Sapsworth (third from left on the engine) and men of Ryde Fire Brigade pictured outside the Brunswick Street fire station soon after its opening. In 1908 the Captain also finally got his way with regard to a steam fire engine. On 8 October the new Merryweather Greenwich Gem appliance was offloaded onto the pier, horsed, and driven up to St Thomas's Square by Captain Sapsworth and men where a large crowd had formed to see the new appliance. Sapsworth immediately put the new engine to work, spraying vast powerful jets of water high into the sky at the front of the Theatre Royal (images below). In 1909 he was less than impressed with the Council's decision that the town's firemen should be sworn in as special constables. It wasn't public knowledge at the time but over the next few years it became evident that Police Superintendent Charles Greenstreet of Ryde Borough Police was strengthening his hand in resistance to merge his force in to an Island wide constabulary. It was possibly this which invoked the Captain, by now approaching his fiftieth birthday, to re-evaluate his life. 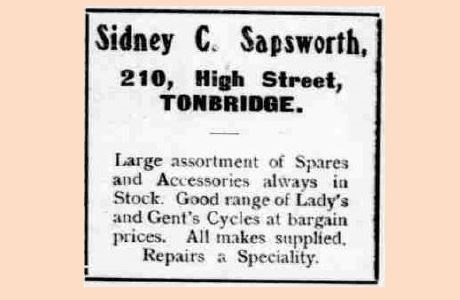 He tendered his resignation in October 1910 and made plans to move back to the mainland and re-establish his business in Tonbridge. He left in November although he returned briefly in January 1911 to attend a function in his honour created by the firemen he'd left behind. For over twelve months the brigade were effectively leaderless, and suffered as a consequence such that equipment and drilling deteriorated. By March 1912 the sorry state of the brigade, evident to all in the town, was ripe for Police Superintendent Greenstreet and his cronies on the Council to play the card they'd been hiding for so long by appointing Greenstreet's constabulary clerk Harry Hammond as the new Chief Officer of a redesignated Police-Fire Brigade. Whilst such an organisation wasn't uncommon in larger towns and cities on the mainland, it was the only one to exist on the Island and by the end of the First World War was agreed to have been an abject failure and the two organisations separated. By that stage Sidney, who never returned to fire brigade work, was happily running his expanding business in Tonbridge. Sidney was unwell for a protracted period before his eventual death and when he passed away it was remarked upon in the County Press in an article expressing the admiration in which he was held by many people of the Island. He passed away on Tuesday 30 November 1926 and his body was returned to Richmond for interment. Rest in peace Captain Sapsworth.